Getting to and Paying for Your Florida Cruise: Saving money takes a bit of work but the payoff can be really worth it! Tigger Travels - Family Adventure Journal Photos From Tigger`s Travels and MORE! Shorter travel time leaves everyone happier! Our family travels a lot for the average person. People frequently ask us for advice on how they could travel more. When they ask seriously, they should be prepared for a conversation that may last hours. One day on our November 13th cruise, we met a great family from Houston sitting at the table next to us for High Tea in Palo. Not only did we outlast the serving staff, we moved to the Meridian Lounge for a couple more hours. We take our travel seriously. 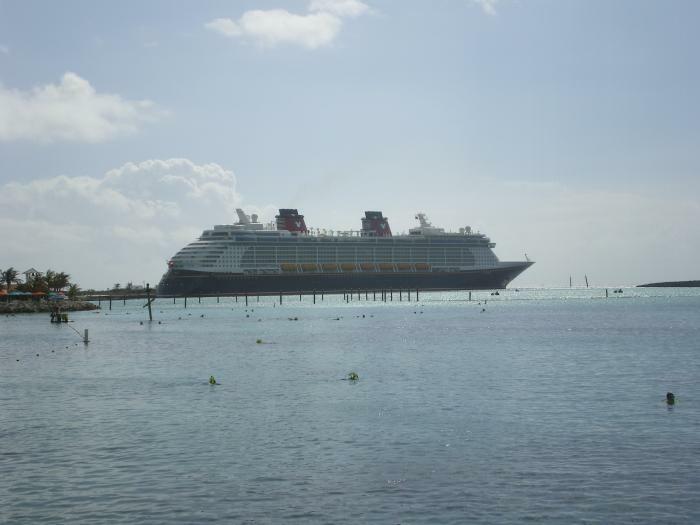 For those traveling on a Disney Cruise, there are a few things that are important to know. Most important for those that love cruising like we do is to never leave the ship without booking your next cruise. The deals offered on the ship are nearly unbeatable. Now, many people we talk to, the very first thing they reply with is, "I don't know if I can afford to cruise THAT much!" Well, the date of the cruise is unimportant. Disney is great about moving your cruise to another date and you still get the same savings and shipboard deals. This means, as you get closer to the time you board and realize you are not going to make it, change the dates. IMPORTANT: There is a time after which you cannot move a cruise, don't wait that late! Over the years we have moved our departure dates up and back a number of times. One year, we were booked on a big cruise in the summer. 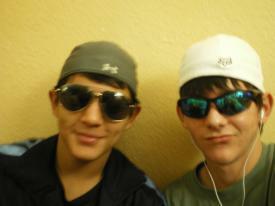 Because we cruised with Disney before we were sent an offer for 'Kids 17 and under Cruise Free'. That was unusual. Normally, it was for '12 and under'. With the money we saved for our teenage boys sailing free and all that we paid ahead, we moved that trip up to spring break, months earlier. 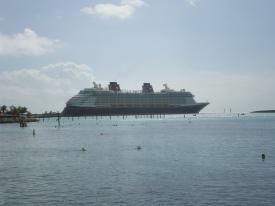 This was the Disney Dream at Castaway Cay. Did you catch that next point? 'Pay ahead!' If you charge your trip to a credit card and pay it out over time after the trip, your vacation will cost a lot more than you thought and all your savings is out the door! Two to three times more is just the beginning and most people pay up to ten times more! DO NOT CHARGE YOUR CRUISE TO ANY INTEREST BEARING CARDS OR ACCOUNTS! 'Pay ahead' is even more important. Book your cruise far enough out (we generally book a year or more ahead) so that you can make payments on that cruise ahead. Make a concerted effort to pay a few hundred or more on the cruise each month. Because it is not a loan or charge account you can skip a month if the bills piled up unexpectedly one month. Paying ahead is nothing short of LIBERATING! Another one of the benefits of booking on board, you get a shipboard credit for doing so. An extra $200-400 on your account when you board is nothing to scoff at! That can cover tips and/or various expenses to which you look forward. Just think, a guilt free trip to the Rainforest Room or extra visits to Palo or Remy are more fun when they really did not cost you any extra! 'Pay ahead' on everything you can. Disney and other cruise lines allow you to even pay ahead on tips and account credit. The goal is to board and disembark from the cruise with no debt from that trip! Travel to the cruise terminal is important, too. We planned to drive to this cruise from Arkansas to Florida but at the last minute we found a flight that took us directly to and from Orlando that would save a lot of money, mileage and time. 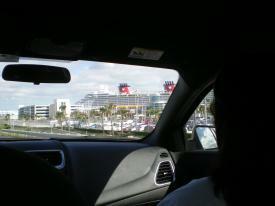 There is nothing better than seeing your cruise ship appear on the horizon the day you board. Our flight deal was booked about a month ahead of our departure. Don't stop checking prices on flights, you never know what will effect those prices. Demand, time of year, time of the week, time of day and even politics, in our case, can effect the price. Keep an eye on it about once a week or two. Subscribe to any 'Specials Newsletters' and compare them to the travel sites.